Ann Watts Moses remembers how much her late husband, Daniel Watts '37, loved Elon and his life as an educator. To honor Dan and his work, Ann made a gift using IRA assets to endow the Daniel T. Watts Award for Undergraduate Research, which will assist students doing research in the mathematical or natural sciences. "Research was Dan's life, and Elon is where he got his start," Ann says. "I wanted to do something to honor him and his profession." Ann learned early in life about the importance of education. She grew up on the campus of Lynchburg College, where her father, Riley Montgomery, served as the school's fifth president. A love of learning was one of the many things she and Dan shared. "Elon was important to Dan," says Ann. "He felt like Elon educated his entire family and changed their lives." Dan Watts was one of eight siblings to attend Elon. His sister, Jo Watts Williams '55, Vice President Emerita and Professor of Education Emerita, served her alma mater for more than four decades, including as a faculty member, vice president of development and special assistant to the president. After graduating from Elon, Dan earned his doctorate in pharmacology from Duke University. During his 40-year career, he served on the faculty at the University of Virginia, West Virginia University and what is now Virginia Commonwealth University Medical Center. He was devoted to his students and his research in physiology and pharmacology. In 1994, he and Ann made a gift to establish the Watts Scholarship in Biology at Elon. Ann has continued to generously support Elon, including making a planned gift to sustain the Watts Scholarship in perpetuity. 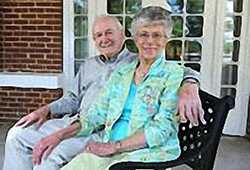 She and her husband, Norris Moses, are members of Elon's Grandparent Leadership Society, which recognizes donors who make annual gifts of $5,000 or more or have given a cumulative total of $25,000 to the university. "I feel very fortunate to be able to make this gift," Ann says. "It has allowed me to establish something in Dan's name and support Elon students."